The Koolulam music project is a fabulous initiative that breaks down the barriers between the different sectors of Israeli society. The project brings together people from diverse backgrounds with an invite to explore our shared aspirations for peace, joy and communion. secular groups and of course large Muslim, Christian and Druze populations, and so on all the way down to much smaller minority groups like the Baha’i. One would perhaps think that with this great assortment of peoples, comes much division, as is portrayed by the media, but the truth is quite the opposite. Most Israelis, of all persuasions, feel very much unified. Koolulam is a musical and social venture aimed at bringing together people from all corners of this diverse, multi-cultural Israeli society. The idea behind Koolulam is to stop everything for a few hours and just sing – together. The project enables its participants to enjoy the feeling of togetherness through a deep communal experience. With sounds and voices coming together to create a social choir, full of hope and optimism. 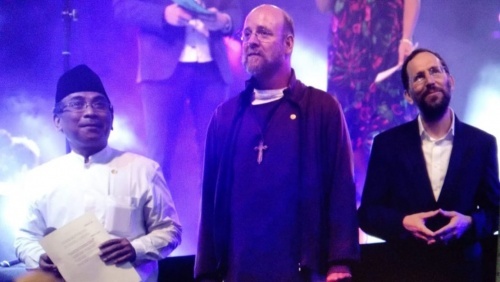 On June 14th, 2018, in honor of the historical visit to Israel by Indonesia’s religious leader Sheikh Haji Yahya Cholil Staquf, Koolulam invited 1000 people who had never met before to a special event at the Tower of David in Jerusalem, to sing one song, in three languages and in three-part vocal harmony. The event was produced in conjunction with the Tower of David museum and Jerusalem.Com. Here is a great article describing the experience of those who gathered for the event. If we’re not able to show love today.